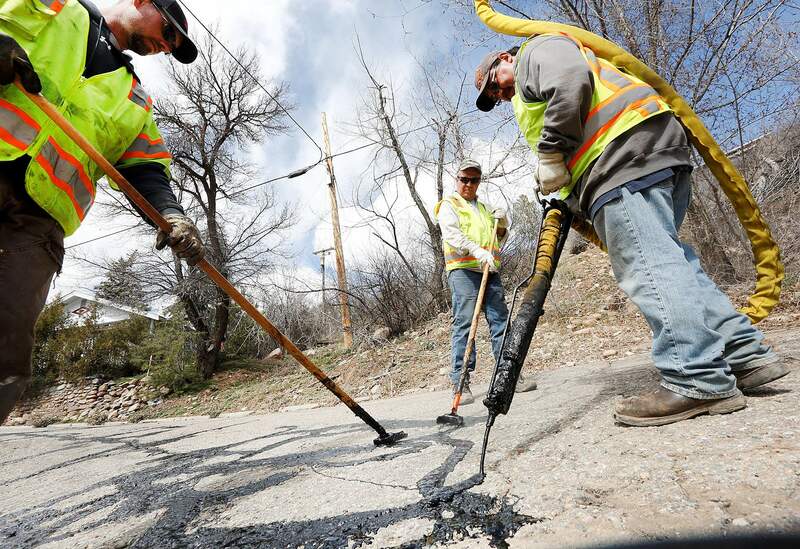 In March 2014, city employees John Phillips, left, Duane Johnston, center, and Gene Ramirez use hot oil to fill in cracks on the streets in east Durango. The city will ask voters in November for a tax increase to fund construction and maintenance of streets, alleys, curbs, gutters and sidewalks. Durango city councilors Tuesday unanimously approved asking voters for an $8.7 million tax increase request when they go to the polls in November. The increases would pay for general city services, such as street maintenance and police. The additional city revenue would cover projected budget shortfalls and long-term construction needs, including a new police station and $15 million in other facilities costs. “We’re at a point in this community where we’re growing, and we’re at a point where we need to pay for this,” Councilor Melissa Youssef said. Mayor Sweetie Marbury said the city is at a point where it soon won’ t be able to add police officers. In a work session last week, councilors agreed to ask for a 5.4 mill property tax increase and a 0.55 percent increase on sales taxes. The sales tax increase would raise the total sales tax rate in Durango from 7.9 percent to 8.45 percent. If the 5.4 mill increase were approved, homeowners would pay $140 more per year on a home with an assessed value of $400,000. The city estimates if voters approve its tax increase, it would raise only $7.5 million. However, officials included a higher dollar value in the ballot question, so if a strong economy creates more revenue than expected, the city would not have to return the excess funds to residents under provisions of the state’s Taxpayer’s Bill of Rights constitutional amendment. The tax question was shaped by months of public meetings focused on projected shortfalls in the city budget and a statistically valid survey of residents about how to deal with that shortfall. In the survey, 58 percent of respondents supported a sales tax increase and 33 percent supported a property tax increase. Tax increases would sunset in 2043 under language approved Tuesday by the City Council. Marbury, a skeptic of a sales tax increase, supported the 0.55 percent increase in part because Farmington is also increasing its sales taxes to 8.375 percent. She had been concerned that a sales tax increase in Durango could drive more residents across the border to shop. Before a new police station could be built, voters would be asked to approve issuance of debt in a separate election. To generate other revenue, the city expects to raise $500,000 by increasing fees and decreasing the amount of general sales tax collections devoted to the Parks and Recreation Department. The mortgage on the Durango Community Recreation Center will be paid off in December and that will free money for expenses within the department. Raising fees could raise about $200,000 by charging more on services, such as spring and fall cleanup, use of Greenmount Cemetery and a 20 percent increase on new and renewing business license fees, among others. While the amount raised through fees is small compared with total needs, councilors supported increasing fees based on residents’ feedback. The city’s survey found 50 percent of respondents supported increasing fees and cutting services to deal with budget deficits. Fee increases would be approved when the council votes on the 2019 budget.